The User must check the regulations acceptance box. After approving the form and validating the data, an inactive account is created. The User is sent an email containing a hyperlink to confirm the registration. Once the User enters the address defined by the hyperlink, the account is activated. Having activated their account, the User can log into it using the login and password defined during the registration process. After logging in, the User can use all the website’s functions available to him or her. The User must not disclose the password to any third persons while using the website. A logged-in User can also see all the auctions added by Users. After logging into one’s account, the User can edit it and change the data introduced during the registration (1.1.). The User may introduce into the system only full and real identification data and must update them on-line. The User must not delete the data necessary for the functioning of the account. Auction’s starting date – choose the auction’s starting date in the calendar’s options and set the date of your auction’s start. Auction’s ending date – choose the auction’s ending date in the calendar’s options and set the date of your auction’s end. Completed auction – while adding a new auction, do not change this auction’s status option because it is set by default as ongoing; choose this option from the top-down menu only when the auction finishes to set its status as completed. Auction’s description – add a full description of the added auction here. Auction’s main picture – in order to be calibrated, the auction’s profile picture should be a 340x340px square. The allowed formats are jpg and png. Search engine – enter auction’s title – it enables finding an auction of your interest after entering its name. Users choose on their own the time for which they want their auctions to be featured and they pay for this period. A featured auction appears under the main banner of the website and allows to display the name of the auction house, the auction’s main picture, the auction’s starting and ending time and the summary of a given auction’s description. Users choose on their own the time for which they want their auctions to be labeled as new. A new auction appears below the featured auctions of the website and it allows to display the name of the auction house and of the auction, and the auction’s starting and ending time. The User, Auction House, can choose the period of time for which his/her auction is to be visible in the calendar and in the upcoming events displayed below the calendar. The calendar is displayed under the main banner on the right, next to the featured auctions. Auction’s preview is the access to the option of displaying our auction published on PhilanetAuction. After adding a new auction, the User does not have to add particular lots manually; he/she can use the import tool available on the website. There are two stages of the import process. In the first stage, we load the prepared “import.csv” file, next we add the prepared “images” file. The import file is based on the structure of the file used on stampauctionnetwork.com. If you already own such a file, you can import it into your auction. If not, download its structure from here. The file should be in the CSV format, with “;” (a semicolon) as a separator. If you have a XLS file, save it in the CSV format. The file should be saved in the UTF-8 code, otherwise its content may contain mistakes. 2. Inside this catalogue create catalogues for the item being auctioned; the name of the catalogue should be LOT number. 3. In such a catalogue save the images of a given item. 4. The “images” catalogue prepared in this way should be saved in the ZIP format. Only jpg/png/JPG formats of the images are allowed. No other formats will be accepted. The image width should be at least 390px (but this is not obligatory). Uploading pictures may take from several minutes up to around an hour or more depending on the image size and their number. The User can delete an auction altogether from the website. In the Subscription bookmark, the Auction House can access the subscription payment section and choose to buy a 3, 6 or 12-month period of services to be provided to it by PhilanetAuction. Paying for subscription makes it possible for the auction House and its business card to be displayed on the list in the Auction Houses bookmark and allows to publish auctions. 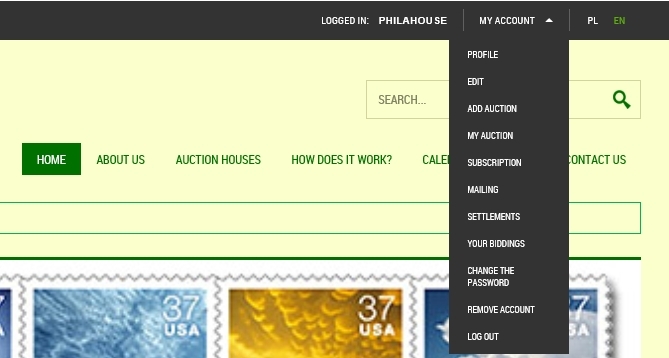 Here the User can access the mailing made available by PhilanetAuction. Auction Houses can send emails to other PhilanetAuction Users, provided that the messages contain only information concerning the auctions being published, the Auction House and the offered philatelic items by entering its content and, additionally, a URL hyperlink and/or a picture. 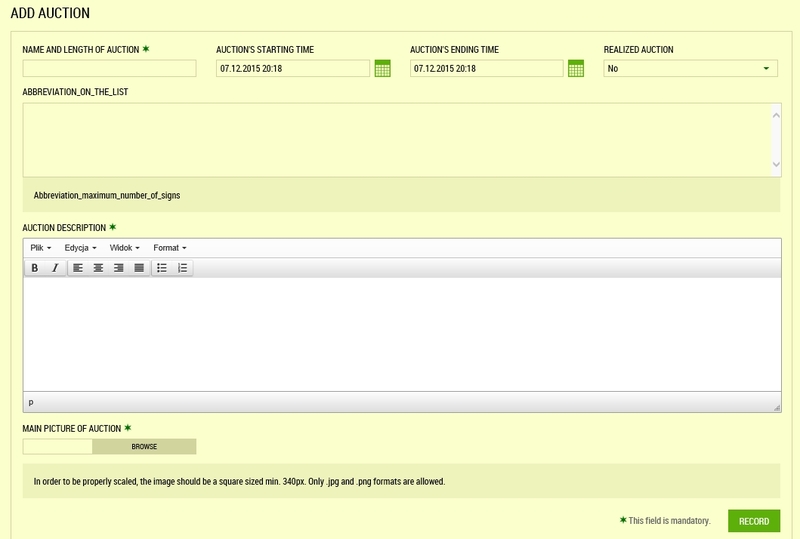 Users can preview all the orders purchased on PhilanetAuction. Auction Houses can participate in the bidding of items offered by other Users. In Your biddings, Users can view and edit their biddings. Users can change their password used to log into the service. Users can delete (unregister) their accounts. This can be done only if the following conditions are met: the User does not have any active offers and all the payments for PhilanetAuction are made. After finishing the use of PhilanetAuction, for the safety purposes, it is advisable to log out from the service.